When the ASHAWire publications platform launched in 2014, “Discover More” was the phrase we used to describe its value. By connecting you to related articles from The ASHA Leader, the four scholarly journals, and the Perspectives publications of each of the 18—now 19—ASHA Special Interest Groups (SIGs), we hoped you’d find more of what you need in the publications and their extensive archives, as well as discover more you didn’t know existed. Perspectives began 25 years ago as a newsletter for the SIGs. However, it soon offered more substantive content, eventually evolving into specialized periodicals bridging research to clinical practice. As the number of SIGs grew, though, maintaining separate publications for each one made finding articles trickier. Any SIG affiliate has full access to new content from every SIG, plus more than 2,500 archival articles. But going to 19 separate locations to see them wasn’t exactly a picnic. The new Perspectives of the ASHA Special Interest Groups brings all SIGs into a single publication. Like the journals, it’s now “continually” published, so important articles get released immediately rather than waiting on an entire issue. From a single website, SIG affiliates can easily access articles from any SIG with one or two clicks. At the article level, we’ve added tools that build on the notion of discovering more as well. Perspectives is now tracked by Altmetric, so whenever an article has been mentioned on social media, in blogs or news outlets, or even as a Wikipedia reference, all of that activity is fully tracked and visible through the connected Altmetric dashboard. Just look for the Altmetric “badge” on any article that has been the subject of such activity and click into the dashboard to see what colleagues are saying about the article, to find new people to follow on social media, or to read news articles about the issues covered in the article. We also radically changed our PDF version of articles—this is also true for the journals—to support greater discovery and use. We now provide ReadCube PDFs. This enhanced PDF platform includes links to supplemental materials, related ASHA articles along with similar articles indexed by PubMed or Google Scholar, hyperlinked references, options for saving and managing PDFs in your own library, and a host of other features, such as highlighting and annotation tools. We also launched with articles from a number of other SIGs as well. There’s much more available to discover. And every SIG affiliate is automatically signed up to receive a monthly email alert featuring every recently published article. The first alert went out April 15 and subsequent monthly alerts will also go out around mid-month. In addition, we launched a Perspectives Twitter account to help you—and users throughout the world—keep abreast of what we publish. If you Tweet, please follow us at @SIGPerspectives. 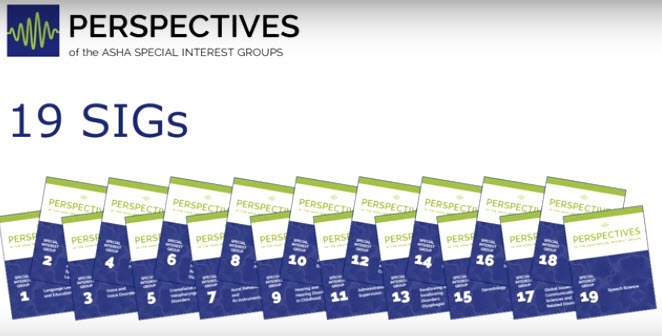 Perspectives continually gets rated as the top benefit of belonging to a SIG, generating a loyal following of members keeping up with the latest in their field and taking advantage of $5 continuing education self-studies throughout the year. Perspectives remains an exclusive benefit of affiliating with the SIGs. To get full access to Perspectives, you can join a SIG for $35 per year.